Sunday January 13th 1884 We just visited and rested today. Mr & Mrs Hodgeman came to see us and Mr Veers and Kit spent the day here. Charlie and John were over on south hill in the afternoon. 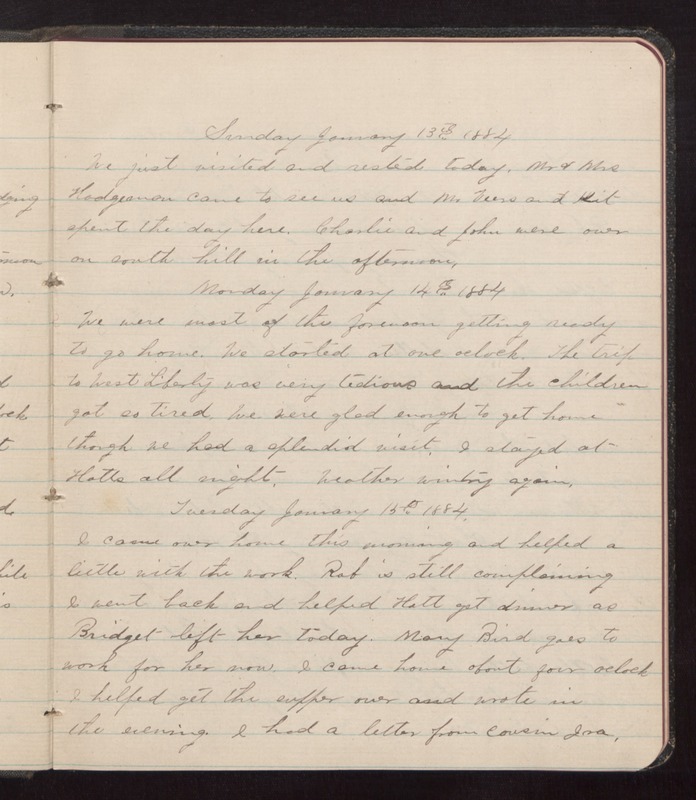 Monday January 14th 1884 We were most of the forenoon getting ready to go home. We started at one oclock. The trip to West Liberty was very tedious and the children got so tired. We were glad enough to get home though we had a splendid visit. I stayed at Hatts all night. Weather wintry again. Tuesday January 15th 1884. I came over home this morning and helped a little with the work. Rob is still complaining I went back and helped Hatt get dinner as Bridget left her today. Mary Bird goes to work for her now. I came home about four oclock I helped get the supper over and wrote in the evening. I had a letter from Cousin Ira.